Remember that ad I did with Andrew Bagley a little while back? He mentioned that he had been working on a pretty cool Augmented Reality piece for a major national magazine that would come out soon. That magazine was WIRED magazine, and the augmented reality spot was a little widget calling attention to Vampire Power. 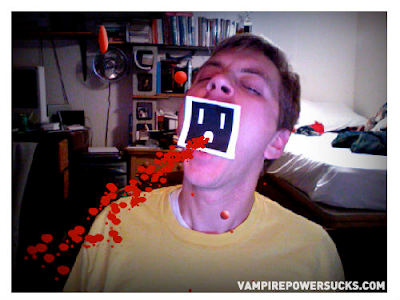 See my picture on the Vampire Power website. Try it. It's fun. And on the intro page, you might recognize some of the faces they demo at the bottom. (Did I just curse in a different culture? I have no intention to curse, but really, it is bloody).